Matches and white sugar are among the products made with sulphur hewn by hand from an active volcano in Indonesia. Is this one of the most dangerous jobs in the world? The traditional sulphur miners of East Java bear the scars of their labour - poisoned lungs and skin criss-crossed with burns and scars. 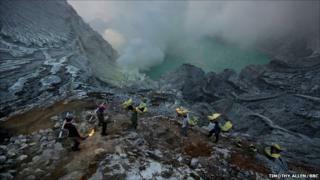 Several hundred men work in the heart of Ijen volcano in East Java, Indonesia. Each day, they collect yellow lumps of sulphur that solidify beside its acidic crater lake. Once processed, the sulphur is used to bleach sugar, make matches and fertiliser, and vulcanise rubber in factories at home and abroad. Filmed for the BBC's Human Planet, the miners carry 90kg loads up 200 metres out of the crater and back down the volcano's outer slopes to a weighing station - a journey they make several times a day. "There are many big mountains but only one gives us the sulphur we need," says Sulaiman, 31, who has mined the crater for 13 years. The miners have little in the way of protective gear beyond a damp cloth to cover the nose and mouth. Gloves and gas masks are an unaffordable luxury for men paid $10 to $15 a day. In the past 40 years, 74 miners have died after being overpowered by fumes that can suddenly swirl from fissures in the rock. The poisonous clouds are not steam, but hydrogen sulphide and sulphur dioxide gases so concentrated they burn the eyes and throat, and can eventually dissolve the miners' teeth. During filming, the BBC crew was enveloped in a toxic cloud 40 times the UK's safe breathing level (no limits exist for the miners). Corrosive air-borne particles ate into the cameras, which promptly broke down. It is a method of sulphur extraction that has all but died out, says volcanologist Clive Oppenheimer, of Cambridge University. "Until the late 19th Century, there were sulphur mines in volcanic countries such as Italy, New Zealand, Chile and Indonesia." Eruptions, and the advent of new processes, led to the closure of most mining operations. "There are still volcanic sulphur mines in the Andes, but these are mechanised," says Dr Oppenheimer. An active vent close to the lake shore is used for the sulphur mining operation. The water in the crater - which is one of the world's largest - is acidic enough to dissolve clothes, eat through metal, and cause breathing problems. Pipes are driven into the fissures in the rock to extract sulphur from the bowels of the mountain. It is blood red when molten, and turns yellow as it cools and solidifies. The miners break the cooled sulphur into chunks, and load up their wicker baskets for the 200 metre climb back up out of the crater. Each man carries up to twice his body weight from the crater to the weighing station part way down the mountain. The work takes a toll on their bodies. But their bodies have, in turn, adapted. Many can hold their breath for extended periods, like the freediving Bajau fishermen of Malaysia, and some have hyper-developed shoulder muscles from years of lugging heavy baskets up and down the mountain, says BBC researcher Dina Mufti. "Our families worry when we come here. They say working here can shorten your life," says Hartomo, 34, a sulphur miner for 12 years. "I do it to feed my wife and kid. No other job pays this well," adds Sulaiman. Human Planet is broadcast on Thursday 10 February at 2000 GMT on BBC One, and will also be available on the BBC iPlayer.